FINALLY! 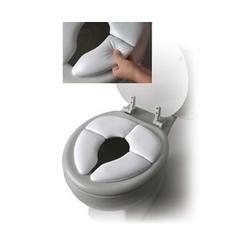 A comfortably padded folding potty seat to take with you on short or long trips. The Cushie Traveler™ Folding Padded Potty Seat is compact enough to carry in your diaper bag yet still provides the comfort and familiarity of the seat that your toddler uses at home. It is also designed so that it is easy to clean with a wet wipe and features a washable carry bag.